Stamps, coins, stickers, and now whisky… what is it about memorabilia that makes us want to collect it? Tom Bruce-Gardyne explores the psychology behind whisky collecting, and that slippery slope from part-time hobby to serious investment. Evolutionary theorists suggest a collection was a way for a man to attract potential mates by signalling his ability to accumulate resources. Well, it may have worked for our Stone Age ancestors, but somehow a stash of old stamps, vintage comics or bottles of Macallan Fine & Rare wouldn’t have much pulling power these days, you’d imagine. In the words of theartofmanliness.com in its 2016 Ultimate List of Hobbies for Men, ‘Collecting is something a lot of men love and most women just don’t get’. 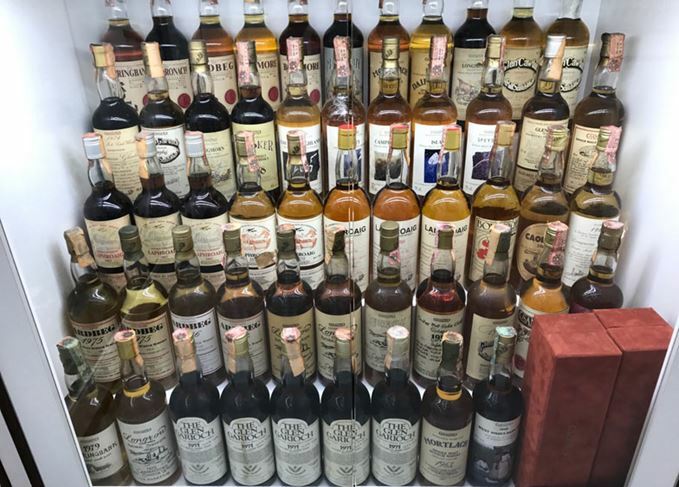 The advice of author and inveterate collector Hunter Davies to ‘never collect for investment,’ is routinely ignored by whisky collectors. Many will have made a similar journey to Andy Simpson, co-founder of Rare Whisky 101, who progressed from whisky drinker to collector by ‘buying one to drink and one to keep, and inadvertently becoming an investor’. He warns investment clients with rare bottles about ‘the double D’ – as in, don’t drink it or drop it. Yet the whole secondary market sits on the three-legged stool of drinkers, collectors and investors, with the latter reliant on the other two. If rare whisky becomes too expensive to drink or collect, the whole stool will collapse. There is not a whisky collector who doesn’t bemoan the soaring prices at auction and from the producers themselves. The Ardbeg aficionado, Geert Bero, suggests that distillers should sell some rare bottles opened and unsealed just for drinking. It’s a nice idea but I doubt it’s a top priority at Macallan HQ. Because so many bottles are bought for re-selling, Bero has learned to relax at auctions. ‘In the old days I felt I had to get it on the day itself,’ he says. ‘Now I say: “why panic, it’ll come along again”. Some bottles I missed I went a long way to find, but then I just stopped and said: “it’s only a bottle of whisky. It’s only distilled barley.”’ That sounds a very healthy attitude. By contrast, any speculator betting on the rising price of rare whisky will have heard the glib advice that ‘you can always drink your investment if the value falls’. For your average bottle flipper, the taste of that financial loss would really stick in the throat. But when it comes to tracking down a full set of whisky that old saying of ‘it’s better to travel than arrive’ certainly seems to apply. Well, it does for Sandrin who says: ‘I collect the Italian bottler Samaroli and whenever I see one I haven’t got it brings me alive a little bit. If I thought I’d got to the end, then the game is over.’ Having collected all Ardbeg’s official bottlings, Geert Bero has moved on to those of the Scotch Malt Whisky Society. ‘So far, I’m missing 20 bottles,’ he says. ‘It is a journey, but it’s very hard.’ Driving him on, he happily concedes, is the thrill of the chase. This hunting instinct is clearly part of the psychology of collecting. ‘For men in particular,’ wrote the American academic, Steven Gelber, ‘the image of the hunt as both a search for game and as a form of game, imbued collecting with an air of masculinity that legitimised it as an expression of superiority in a Darwinian world.’ Unfortunately, as discussed above, such alleged superiority would be lost on most women. To put it crudely, that shedload of old whisky ain’t no babe magnet. Indeed if the collection gets out of control it could have the opposite effect. The Scotch Malt Whisky Society and Dr. Adam Moore give 120 people the chance to drink for science.